Last weekend, Bike Gob saw the future, and the future was with Gob, and the future was gobs, and the future was good. What happened last weekend you ask Gob? YOU KNOW WHAT HAPPENED YA WINDUP IT WAS PEDAL ON PARLIAMENT! ACROSS LIKE, ALL OF SCOTLAND! And the best thing about it, was that Pedal on Parliament hit Bike Gob's favourite townshire of Glasgow for the first ever time. 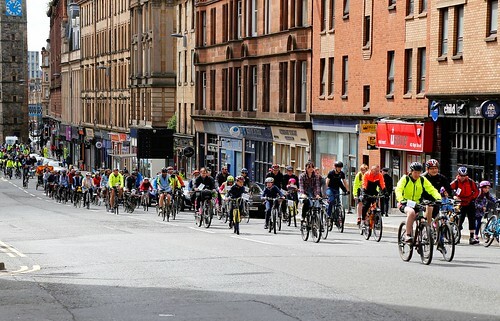 Glasgow, oh Glasgow, how Gob loves you and your bike shouting people the best of all. See all of yous gobs that came along, well yous are the gobs gobbox and thank yous from the bottom of Gob's fork to the very end of Gob's drop-outs. Really, thank you. POP themselves have done a nice round up here but there are some other things that Gob noticed happened, that you might want to hear. So many of the thousands of people who came to POP, brought their families. 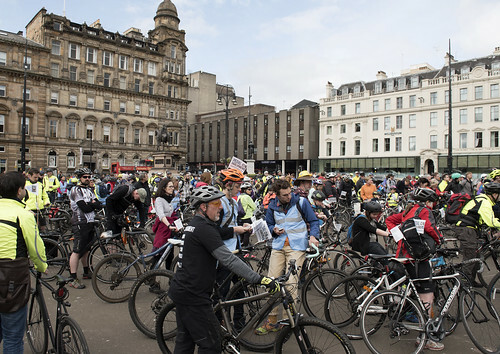 Kids embraced the challenging climb up High Street with vigour, and without having to worry about cars encroaching into their space, arrived sweating and breathless at George Square with smiles on their faces. KUDOS to the kids! Bike Gob's big pal Patrick was there. BG tried very hard to act cool and aloof but was quivering like a loose headset inside. One of the best bits from the speeches (apart from the great banner falling fiasco) was when Patrick shouted "It's not an extreme sport!" at the man from the Posh Party who proclaimed from the stage that everyone ought to be wearing helmets. Nice one Paddy, you got him telt. BG also made a new secret Big Pal who did a big thing that helped POP happen in Glasgow - you know who you are new BG's Big Pal, and you know what you did, so thanks and KUDOS to you wink wink. One weird thing though that BG noticed in the lead up to the Great Inaugural Glasgow POP of 2017 was when BG decided to help the POP people put some posters up, and got a bike shop guy to put one in his window. Bike shop guy seemed a bit you know, "not that bothered" about the whole POP thing, but said to just put the poster up anyway. But then, see a few days later when BG pedalled past the shop, THE POSTER WASN'T THERE ANY MORE! And BG uses high grade on-brand blu-tac and everything. This got BG to thinking about some other people's reactions when talking about Pedal on Parliament. You see, where BG comes from, it feels so simple, like everyone must be able to see that it is obvious that safer cycling is the way forward for so many reasons, and that we should all be asking for that. But so many people, even some of BG's good friends, who BG would think hold the same opinions as Gob, don't seem to get it. And Bike Gob got wrongly upset at a friend who held a difference of opinion. And some of these other people are even cycling gobs. Some people said that "they're just not political". Maybe there is a perception that needs to be broken that a demonstration still involves chucking eggs and smashing shop windows? How do we get these gobs on board? Other roadie gobs said that they themselves don't need cycle paths and so it's not their fight. How do we make these gob's see that they can share their love of something with other people who might also love that thing albeit in a slightly different way? Please help Gob if you know the answer, as Gob is perplexed. Some of this has led BG to have to do a bit of internal hub searching, as for a short little while, it made BG wonder about whether they had got themselves a little bit too entrenched in something, had lost perspective, and was blowing the importance of it all out of proportion. Is it really fair to ask drivers to give up their car parking space in an area they've chosen to live in because it has car parking spaces, just so more people can cycle to work? But don't worry gobs, for this paranoid line of thinking didn't last long. While considering this point, BG got on BG's bike to head to a meet with some awesome (and POP supporting) roadie gobs and a couple of minutes and one close-pass later, was reminded that even awesome riding, experienced, trick performing Bike Gob, takes Bike Gob's life in ones hands every ride, and that just ain't right. 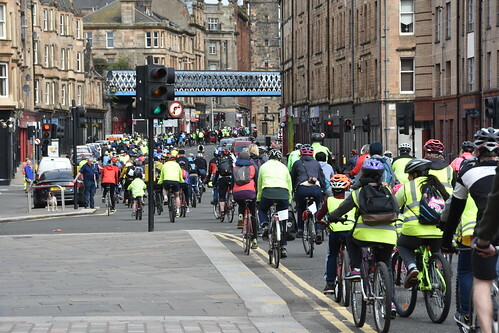 And also, how can you know, little ones, or like, non-road experienced people, be expected to take their lives into their hands and start using bikes for journeys to save the world, with the way things are in Glasgow just now. And this leads BG on to another thing that happened in the aftermath of Pedal on Parliament. Local anti-Bearsway poop rag, the Milngavie and Bearsden Herald, published a snot piece about how a still photo of an ambulance behind a queue of traffic at the Cala Homes roadworks, illustrated that although ambulances are able to get through two way traffic on roads of the same width in other parts of the city, this one mustn't have been able to because of, you've know, the Bearsway. I'm sure you can only imagine the facebook comment outcry, but 200-odd facebook comments later, BG has heard on the grapevine that the editor was contacted directly by a gob with a complaint outlining media standards, ethics of balance and news vs opinion, that led to the post being removed. And all the gobs said YEAH. So if you don't like what you read in the paper, tell them gobs. And what's more, this wonderous story was put up, rightly, and gloriously in it's place.